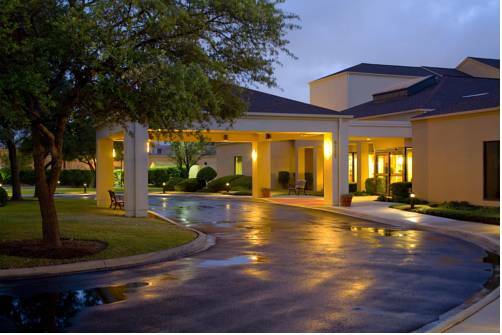 Treating you to an energizing stay, Courtyard San Antonio Medical Center is home to a host of modern amenities to keep you feeling refreshed on your next stay near the South Texas Medical Center and University of Texas Heath Science Center. After a long day of work or play, retreat to cozy hotel rooms featuring complimentary Wi-Fi, plush bedding and coffee makers. Each room also features an ergonomic workspace and a flat-screen TV with premium movie channels, CNN, ESPN and HBO. During downtime, visit our modern lobby area, home to The Bistro - Eat. Drink. Connect. , and satisfy your cravings with breakfast and dinner options, as well as specialty Starbucks beverages and evening cocktails. Active travelers will feel right at home with a well-equipped workout room and a refreshing outdoor pool. Guests in town on business can convene with colleagues in one of two on-site meeting rooms. Whatever brings you to San Antonio, check availability and make reservations at Courtyard San Antonio Medical Center today. Your San Antonio hotel restaurant offers refreshing breakfast choices in the morning and a variety of dinner, beer and wine options in the evening. The Bistro also offers specialty Starbucks coffee drinks to help you get a jump on the day. ~37 miles from San Antonio.